Congratulations to nova c, winner of THE GIRLS’ GUIDE TO LOVE AND SUPPER CLUBS! Deb Kerry is excited to share the fact that BETWEEN hit the Bookscan Fantasy Bestseller list last week in the #22 slot!! Deb Dana is finally (possibly?) coming up for air after her launch on Tuesday. THANK YOU ALL for your amazing support! Deb Susan just learned that galleys of Claws of the Cat are scheduled for completion in early March! Deb Jess Riley has released her first novella! Closer Than They Appear is sweet and quirky tale of missed connections that will fill your heart with the hope and wonder of new love. Bonus: it includes recipes and a fun little extra, inspired by the characters. Deb Linda Grimes is running a contest on her blog to SHARE THE LOVE this Valentine’s Day. Like chocolate and free books? Click the link and comment to enter! You have until noon on Monday…so get clicking! Congrats to recent guest Priscille Sibley whose THE PROMISE OF STARDUST is featured at Target–$2 off with this great coupon. Deb Dana: Ooooh, tough one. 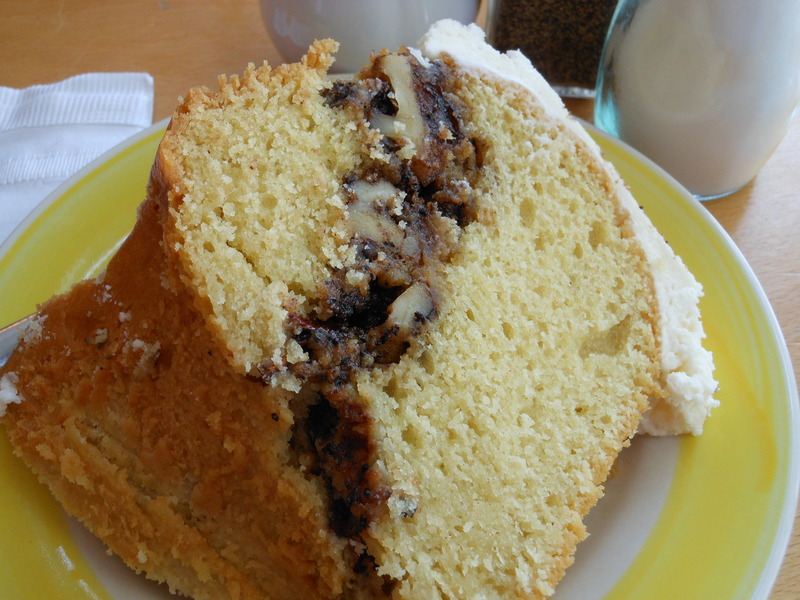 I think it would have to be the Lithuanian Coffee Cake from Claire’s Corner Copia in New Haven, CT. The restaurant is vegetarian and (in my opinion) just average, but the Lithuanian Coffee Cake is to die for. I don’t live nearby anymore, but whenever I visit, I HAVE to stop in and get a slice — with tons of buttercream frosting, of course. Deb Kelly: You already know about my crunchwrap supreme issue. On the other end of the spectrum, I love lobster and once ate an entire pound of lobster roll at Red’s in Wiscasset, Maine. That was a delicious mistake. Deb Kerry: Homemade hot fudge sauce, put in the fridge to chill until solid and then eaten with a spoon. No ice cream required. Deb Susan: I’m a big fan of many kinds of food, but when you say “guilty pleasure” I’m going to delve into the recesses of the “foods I love but don’t eat often” files. And if we’re going there, the #1 item is a coffee chip ice-cream sundae with hot fudge and whipped cream sitting on a nest of meringue. Oh yes, that’s definitely the one. Your Turn!! What’s your favorite treat to eat? ← The Debutante Ball welcomes Julie Kibler! My favorite guilty pleasure food? Hmm…not chocolate, because I’m waaay past feeling guilty about that. Besides, it has antioxidants, so I’m pretty sure it’s a health food. I’d have to cheap, chewy candy, like Swedish fish or Skittles or taffy. Absolutely no redeeming nutritional value, and yet so satisfying to my inner candy monster. I generally don’t eat grains or dairy, but last night I had some kind of amazing pizza. I refuse to feel guilty about it, though. Yay Deb Kerry – that’s awesome news! Deb Kerry, that is so beyond great!